The V102F-R mates with either the V100 Bead or the V100B Hermetic Bead. Anritsu has Stress Relief Contacts available ("Sliding Contacts"). They provide protection to the connection in the event of temperature changes, shock or vibration. The V110-1 is used for microstrip and Coplanar waveguide with 0.15 mm trace widths. When used with Coplanar Waveguide, some engineers use a pin-overlap design, which allows the pin to be soldered directly to the trace. Ribbon bonding can be used to connect the pin to the trace. The pin can also be attached to the trace using silver epoxy. 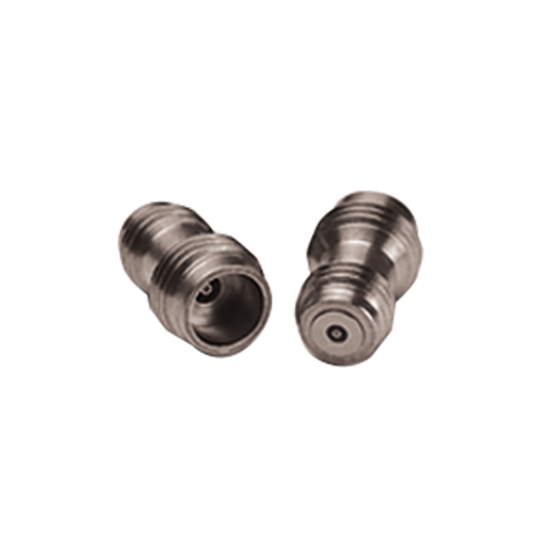 Use the 01-105A Male & Female Sparkplug Torquing Kit to tighten the V102M and V102F connectors into the housing after the bead is installed. We show how to use all of these tools in the Connector's Installation Note. The V102F-R is RoHS compliant. It contains less than the Maximum Concentration Values (MCVs) for Lead, Mercury, Cadmium, Hexavalent Chromium, PBB and PBDE per EU directive 2002/95/EC. The following RoHS exemption applies: Lead as an alloying element in copper containing up to 4% (40000PPM) lead by weight.